Harlequin in hotel design is traditionally a black and white flooring pattern used in grand, public spaces. The design aesthetic originated in palaces and cathedrals, and historically its use in hotels sought to elevate the perceived class of an establishment through association. In more recent decades, Harlequin has been used in areas of circulation and in guestrooms as both a floor and wall treatment. Harlequin can be created from any material, although, it always takes the form of a planar cladding. Harlequin patterns are oriented at either a 90-degree angle or a 45-degree angle to a reference element within the space it is used. A reference element may be any defining characteristic of a space, be it the entry door or the base of a column. From one's perspective, the Harlequin surface either reads as a checkerboard pattern (90-degree orientation) or a diamond pattern (45-degree orientation). In the earliest instances of the practice, a checkerboard pattern would be used as a border to a larger design or as the pattern used for smaller areas such as circulation paths and thresholds. The diamond pattern was most often employed in larger expanses (and in a proportionally bigger scale) and was generally considered the more elegant orientation of the two. These uses are practical, as the checkerboard orientation is more efficient to use if one is cladding a narrow rectangular space. Diamond patterns necessitate more half units around the perimeter, so the greater the ratio of square footage to perimeter there is, the more efficient the design will be to install. Therefore, it makes sense that the expansive spaces such as hotel lobbies would generally feature diamond patterns, while the smaller areas were checkered. At the beginning of the 19th century, when the modern hotel began to emerge in both America and Europe, Harlequin was already an established style of flooring. The black and white pattern, most often rendered in marble, first appeared in England at the beginning of the 17th century. Because of the expense of the material, the pattern was used only in grand private estates and in religious buildings. Indigo Jones is cited as the first to introduce marble floors into classical English buildings after his trip to Italy in 1614 (where the practice had already become famous in the 15th century).1 One of his first installations was the entrance hall to the Queen's House in Greenwich, London in 1635.2 After that the pattern became more common and continued into the next century, as seen in the Neo-classical great hall of the Syon House (1761) designed by Robert Adam.3 Harlequin also had been established as more than an interior practice; it was used as the flooring of the outdoor colonnade of the Grand Trianon at Versailles designed by Jules Hardouin Mansart in 1687. Harlequin was particularly popular in churches and it was laid as the flooring in the choir of Westminster Abbey in 1690.4 In 1710 the pattern was installed on a much larger scale by Sir Christopher Wren. He designed the black and white diamond-oriented pavement in the nave of London's St. Paul's Cathedral (1675-1711) that completed the classical interior.5 Other places of worship emulated the practice, and it was still popular when Sir George Gilbert Scott included it in his flooring design for the Worcester Cathedral in 1874.6 The fact that Harlequin was in cathedrals is particularly important, because unlike the palaces of the nobility that similarly featured the practice, these architectural marvels were public spaces experienced by all classes of people making them familiar with the elegant flooring pattern. In the second half of the 19th century, hotels continued to grow in their number of guestrooms, grandeur, and public offerings. The initial perception of the quality of a hotel was intrinsically tied to its lobby. Not only did it give paying guests their first impression of the establishment, but most lobbies (and adjacent restaurants, bars, and lounges) were open to and utilized by the public who helped shape a city's perception of the business. For this reason, hotel lobbies and their adjacent public areas competed to be the most impressive and well-appointed. Because of Harlequin's rich history, it is no surprise that hotels featured the pattern in their lobbies. These spaces capitalized on the aesthetic correlation drawn between their interiors and some of the grandest architectural spaces in the world. The Strand block of London's Savoy Hotel (1889) was completed in 1904 and was the design of architect T. E. Collcutt. The hotel's main focus was to be luxurious, and the lounge was no exception.13 The lounge's floor was paved in an elegant Harlequin pattern that changed orientation to identify the entrance from the greater lounge space. 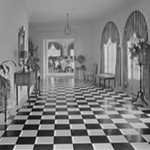 14 The threshold of the lounge, identified by the flooring section between the large columns, featured a Harlequin pattern in which the tiles' edges were parallel to the square base of the column, and they formed a checkerboard pattern. The tiles of the main floor, however, were turned at a 45-degree angle to those of the threshold so that they read as a diamond pattern. The lounge's Harlequin floor was seen as too formal for the function of the space; when patterned rugs were added, they covered most of the design. In 1913 the new Hôtel Bellevue in Bern, Switzerland was finished after replacing its predecessor that stood from 1865-1911. The hotel featured a Palm Court illuminated by an intricate glass ceiling. As in the lounge of the Savoy, the threshold of the room was vertically marked by columns - in this instance two large Ionic columns. Also similar to the Savoy was the Harlequin floor pattern demarking the threshold of the room on the horizontal plane.15 The checkerboard pattern was a visually strong motif that marked the end of one space and the beginning of the next. 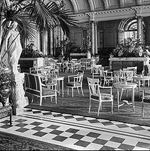 The floor of the Palm Court itself was paved in the same white stone as the Harlequin threshold, but it was downplayed to not distract from the magnificent glass ceiling. In the early 19th century the city of St. Louis was growing rapidly due to its expanding port facilities and strategic location on the road to the American West. The former hotels of the city had been far inferior to those in the eastern United States, but they had suited the transients passing through who looked more for bodily comfort than lavish appointments. When two Bostonians opened the Planters (1841), a hotel as big and elegant as the Tremont (Boston, 1929), the city began its love affair with the grand hotel. As decades passed, more large-scale hotels opened, such as the Lennox (1920). The Lennox featured a Harlequin floor in its double-height reception. The crisp white and black pattern intentionally contrasted with the dark wood paneling of the walls and the delicate detailing on the ceiling.16 This example, oriented in a checkerboard pattern, complimented the more rigid geometry of the room. In 1923 the Biltmore of Los Angeles opened with great fanfare. The newest hotel in John McEntee Bowman's Biltmore chain had 1,100 rooms (each with a private bath) and thirteen stories making it the largest hotel west of Chicago. In its multiple dining facilities and grand ballroom, the hotel could accommodate over 2,500 diners at one time.17 These grand public accommodations necessitated large bathrooms, and the Biltmore's were elegantly appointed to match the rest of the hotel. The men's room featured marble clad walls and had a Harlequin floor. The floors color blocks were each made of nine smaller tiles, a less expansive alternative to large pavers, but it achieved the same desired effect.18 It is important to note that the designers chose the larger-scale pattern of the Harlequin floor for its grand effect. Had the floor been a reorganized checkered pattern alternating the same small tiles, the effect would have been diminished, and the floor would have been perceived as a neutral plane. Later that decade, Schultze & Weaver designed the General Oglethorpe Hotel (1927) in Savannah, Georgia. The resort hotel was located on the Wilmington River and its public offerings were limited to the lobby, lounge, and dining room. The lounge was sparse in decoration and the architectural detailing was limited to a series of vaults above each window that terminated in corbels. The stucco walls and ceiling were pained white, but the floor's Harlequin pattern added visual interest to the space.19 The lounge doubled as a ballroom, and its furniture could easily be removed to open the space for an event. The pattern of the floor, oriented in the more elegant diamond fashion, seemed more appropriate for a gala than as the backdrop to lounge furniture. Famed American decorator Dorothy Draper's generous use of Harlequin floors in her interiors was a well-known signature of her flamboyant style. In her design for the Hampshire House apartment hotel (1937) on Central Park South, she used the pattern in both the circulation spaces and in the Garden Room restaurant and lounge. The project was the largest commercial commission ever awarded to a woman, and "the first time in a hotel of [that] size, all the furnishings and accessories, servant's uniforms, glassware and china, and other details [had] been designed by one person. "20 The corridors, with their proportionally large checkerboard floors, featured excessive white-plaster motifs.21 The flooring added to the whimsical interior and helped create a new iteration of elegance. By the 1970 decade, Harlequin began to be used in instances where it was utilized only for its visual interest; it did not always intentionally reference the pattern's historic precedent in luxury interiors. In the Hotel at Maidenhead (c1970), the lounge area adjacent to the bar was tiled in a checkerboard Harlequin. The minimalist interior was enhanced by the strict geometry of the floor.29 When the Bar/Lounge of the hotel was featured in Principles of Hotel Design, the caption noted that "Sliding screens to cut off bar when closed, but the space left must not appear ‘dead' if the lounge is to be used outside licensing hours. "30 The floor added energy to the simple space that might otherwise have felt barren. In the 1980 decade, New York's Waldorf Astoria was in the midst of a $110 million renovation with a focus on updating the hotel's lavish public areas. Hilton Hotel Corporation owned the 1,600-room mega hotel, and it wanted to ensure that its flagship continued to set the standard for luxury mega hotels worldwide.31 The expansive Silver Corridor with high vaulted ceilings retained its historic Harlequin floor in its diamond orientation.32 The marble floor signified the enduring style of the Schultze & Weaver design, present since it first opened its doors in 1931. New York's first designer (boutique) hotel, Morgans, opened in 1984 with the intent of appealing to "modern trend-conscious guests who abhor[ed] traditional, clichéd hotels. "33 Entrepreneurs Steve Rubel and Ian Schrager (of Studio 54 fame) wanted to create the antithesis of hotels like the Waldorf Astoria. When Frenchman Andrée Putman designed the petite 112-room hotel, he intentionally reinterpreted some elements of traditional hotel design. Harlequin was employed on a minute scale acting as a checkered border for the carpeted corridors.34 The pattern that most often had been given great prominence was relegated to a detail. Harlequin was again adapted, but in the guestroom bathrooms; Putman covered all of the walls and the bathtub surround in the small-scale checkered tile pattern.35 The traditional characteristics of Harlequin were reversed: the usually pleasant aesthetic, rendered in expensive marble, and most often found covering public spaces' floors was an overwhelming, inexpensive cladding of a private chamber's walls. When it opened in 1992, Los Seises in Seville, Spain displayed one of the widest ranges of periods and styles of any hotel in the world.39 Jorge Pena Martin created the hotel from a building complex situated in the archbishop's palace in the city's historic center. During the reconstruction work, the neglected buildings and gardens yielded archeological finds such as mosaics, frescoes, columns, and ancient floors that were then integrated into the hotel's eclectic, modern design.40 The forty-three-room hotel juxtaposed the historical elements with ultramodern furniture and architecture creating a unique environment. In the salon/ bar the diamond oriented Harlequin floor further emphasized the circulation path articulated by columns and a structural wall.41 Past the columns, the pattern of the floor transitioned into the seating areas by having fewer and fewer black tiles and eventually becoming all white marble. Night, a boutique hotel also in New York, opened in 2006 with seventy-two rooms and suites. The hotel's palette was Black White (Intype),43 and it had a Harlequin carpet in its lobby and leading to its small adjacent restaurant, Nightlife.44 Its custom carpeting designed by Mark Zeff featured the establishment's logo in white contained within each of the carpet's black squares. This new twist on the traditional pattern introduced branding into the flooring while still having a recognizably Harlequin design. Harlequin has endured as an archetypical practice due to the fact that it has roots in practice types other than hotels. Were it only a flooring pattern used in hotels, it most likely would have been viewed as a design associated with the period in which it was introduced, and thus something dated and eventually undesirable. Harlequin is interesting in that it exists today in both its unadulterated original form as stone flooring and in various interpretations, both of which continue to be well-received by critics and the public. The continuous use of Harlequin over the last 150 years supports that it will continue to be one of the most identifiable and prevalent design practices in hotel interiors. 1) Jane Fawcett, ed., Historic Floors: Their History and Conservation (Boston, Butterworth-Heinenmann: 1998), 18. 2) Fawcett, Historic Floors, 18. 3) Fawcett, Historic Floors, 147. 4) Fawcett, Historic Floors, 19. 5) Fawcett, Historic Floors, 19. 6) Fawcett, Historic Floors, 21. 7) Elaine Denby, Grand Hotels: Reality and Illusion (London, England: Reaktion Books Ltd: 1998), 159. 8) Denby, Grand Hotels, 159. 9) Intypes researcher Minjin Juliet Yang identified Showcase Stair in her 2005 boutique hotel design study. Showcase Stair is an extravagantly designed architectural feature in which the stair itself becomes a prominent display element. Its functionality is often secondary to the spatial drama created by the stair's structure, form, materials and lighting. Mijin Juliet Yang, "Theory Studies: Contemporary Boutique Hotel Design," (M.A. Thesis, Cornell University, 2005), 50-53. 10) Stair Hall, The Grand  Anonymous, Interior Design; Cavaliere Giulio Podesti, Architecture; Rome, Italy in Elaine Denby, Grand Hotels: Reality and Illusion (London, England: Reaktion Books Ltd: 1998), 160; PhotoCrd: Anonymous. 11) Fawcett, Historic Floors, 18. 12) Reception, Grand Pacific Hotel  Anonymous, Interior Design; William W. Boyington, Architecture; Chicago, IL in Henry End, Interiors 2nd Book of Hotels (New York City: Whitney Library of Design: 1978), 14; ImageCrd: Bettmann Archives. 13) Pricilla Boniface, Hotels & Restaurants: 1830 to the Present Day (London, England: Royal Commission on Historical Monuments England: 1981), 36. 14) Lounge, Savoy Hotel  Arthur Mackmurdo, Interior Design; T. E. Collcutt, Architecture; London, England in Pricilla Boniface, Hotels & Restaurants: 1830 to the Present Day (London, England: Royal Commission on Historical Monuments England: 1981), pl. 49; PhotoCrd: Bedford Lemere, National Monuments Record. 15) Lounge, Hôtel Bellvue  Anonymous, Interior Design; Hoffmann, Architecture; Bern, Switzerland in David Watkin, et al, Grand Hotel: The Golden Age of Palace Hotels (New York City: Vendome Press: 1984), 130; PhotoCrd: Anonymous. 16) Reception, Lennox Hotel  Anonymous, Interior Design; Anonymous, Architecture; St. Louis, Missouri in Catherine Donzel, et al, Grand American Hotels (New York City: Vendome Press: 1989), 129; PhotoCrd: Bettmann Archives. 17) Marianne Lamonaca and Jonathan Mogul, eds., Grand Hotels of the Jazz Age: The Architecture of Schultz & Weaver (Princeton, NJ: Princeton Architectural Press, 2005), 114-24. 18) Bathroom, Biltmore  Anonymous, Interior Design; Schultze & Weaver, Architecture; Los Angeles, CA in Catherine Donzel, et al, Grand American Hotels (New York City: Vendome Press: 1989), 178; PhotoCrd: The Biltmore Hotel. 19) Lounge/Ballroom, General Oglethorpe Hotel  Anonymous, Interior Design; Schultze & Weaver, Architecture; Los Angeles, CA in Marianne Lamonaca and Jonathan Mogul, eds., Grand Hotels of the Jazz Age: The Architecture of Schultz & Weaver (Princeton, NJ: Princeton Architectural Press, 2005), 195; PhotoCrd: V. & J. Duncan Maps & Prints. 20) Carlton Varney, In The Pink, Dorothy Draper: America's Most Fabulous Decorator (New York City: Pointed Leaf Press, 2006), 45. 21) Corridor, Hampshire House  Dorothy Draper, Interior Design; Anonymous, Architecture; New York City in Carlton Varney, In The Pink: Dorothy Draper: America's Most Fabulous Decorator (New York City: Pointed Leaf Press, 2006), 46; PhotoCrd: Dorothy Draper Inc. Archives. 22) Varney, In The Pink, 140. 23) Salon, Quitandinha  Dorothy Draper, Interior Design; Anonymous, Architecture; Rio de Janeiro, Brazil in Carlton Varney, In The Pink: Dorothy Draper: America's Most Fabulous Decorator (New York City: Pointed Leaf Press, 2006), 144; PhotoCrd: Dorothy Draper Inc. Archives. 24) Varney, In The Pink, 144. 25) Varney, In The Pink, 154-67. 26) Lobby, Hotel Elysée  David Barrett, Interior Design; Anonymous, Architecture; New York City in Anonymous, "Hotels Motels," Interior Design 30, no.4 (Apr. 1959): 129; PhotoCrd: Anonymous. 27) Anonymous, "Hotels Motels," Interior Design 30, no.4 (Apr. 1959), 129. 28) Lobby, Waldorf Tower Apartments  Joseph Huston, Interior Design; Anonymous, Architecture; New York City in Anonymous, "Hotels Motels," Interior Design 33, no.4 (Apr. 1962): 140; PhotoCrd: Anonymous. 29) Bar/ Lounge, Hotel at Maidenhead [c1970] Anonymous, Interior Design; Derek Lovejoy & Associates, Architects; Maidenhead, England in The Architects' Journal, ed., Principles of Hotel Design (London, England: Architectural Press, 1970), 60; PhotoCrd: Anonymous. 30) The Architects' Journal, ed., Principles of Hotel Design (London, England: Architectural Press, 1970), 61. 31) Anne M. Schmid & Mary Scoviak-Lerner, International Hotel and Resort Design (New York City: PBC International, 1988), 183-85. 32) Corridor, Waldorf Astoria [c1988] Kenneth Hurd Associates, Interior Design; Schultze & Weaver, Architecture; New York City in Anne M. Schmid & Mary Scoviak-Lerner, International Hotel and Resort Design (New York City: PBC International, 1988), 183; PhotoCrd: Nathaniel Lieberman, IDI. 33) Albrecht Bangert and Otto Riewoldt, New Hotel Design (London, England: Lawrence King Publishing, 1993), 14-19. 34) Corridor, Morgans  Andrée Putman, Interior Design; Anonymous, Architecture; New York City in Albrecht Bangert and Otto Riewoldt, New Hotel Design (London, England: Lawrence King Publishing, 1993), 14; PhotoCrd: Deidi von Schaewen. 35) Bathroom, Morgans  Andrée Putman, Interior Design; Anonymous, Architecture; New York City in Albrecht Bangert and Otto Riewoldt, New Hotel Design (London, England: Lawrence King Publishing, 1993), 16; PhotoCrd: Deidi von Schaewen. 36) Carol Berens, Hotel Bars and Lobbies (New York City: McGraw-Hill, 1997), 159. 37) Lobby, Paramount Hotel  Philippe Stark, Interior Design; Anonymous, Architecture; New York City in Carol Berens, Hotel Bars and Lobbies (New York City: McGraw-Hill, 1997), 112; PhotoCrd: Tom Vack/Nancy Assuncao Associates. 38) Guestroom, Paramount Hotel  Philippe Stark, Interior Design; Anonymous, Architecture; New York City in Brigitte Fitoussi, Hôtels (Paris, France: Editions de Moniteur, 1992), 65; PhotoCrd: Tom Vack. 39) Bangert, New Hotel Design, 94-97. 40) Bangert, New Hotel Design, 94-97. 41) Salon, Los Seises  Jorge Pena Martin, Interior Design; Jorge Pena Martin, Architecture; Seville, Spain in Albrecht Bangert and Otto Riewoldt, New Hotel Design (London, England: Lawrence King Publishing, 1993), 95; PhotoCrd: Harald Raebiger. 42) Guestroom, The Marcel  Goodman Charlton, Interior Design; Anonymous, Architecture; New York City in Edie Cohen, "Meet Marcel," Interior Design 71, no.11 (Sep. 2000): 80; PhotoCrd: Michael Kleinberg. 43) Intypes researcher Rachel Goldfarb identified Black White in her 2008 resort and spa study. Black White describes an interior space that is limited to a black white palette for the floor, wall, ceiling planes and for furnishings. Goldfarb, Rachel. "Theory Studies: Archetypical Practices of Contemporary Resort and Spa Design." M.A. Thesis, Cornell University, 2008, 45-51. 44) Lobby, Night Hotel  Mark Zeff, Interior Design; Anonymous, Architecture; New York City in Bob Morris, "When Darkness Falls," Interior Design 77, no.4 (Apr. 2006): 80; PhotoCrd: Eric Laignel. 45) Evidence for the archetypical use and the chronological sequence of Harlequin in hotels was developed from the following sources: 1890 Stair Hall, The Grand  Anonymous, Interior Design; Cavaliere / 1900 Lounge, Savoy Hotel  Arthur Mackmurdo, Interior Design; T. E. Collcutt, Architecture; London, England in Pricilla Boniface, Hotels & Restaurants: 1830 to the Present Day (London, England: Royal Commission on Historical Monuments England: 1981), pl. 49; PhotoCrd: Bedford Lemere, National Monuments Record / 1910 Lounge, Hôtel Bellvue  Anonymous, Interior Design; Hoffmann, Architecture; Bern, Switzerland in David Watkin, et al, Grand Hotel: The Golden Age of Palace Hotels (New York City: Vendome Press: 1984), 130; PhotoCrd: Anonymous / 1920 Reception, Lennox Hotel  Anonymous, Interior Design; Anonymous, Architecture; St. Louis, MO in Catherine Donzel, et al, Grand American Hotels (New York City: Vendome Press: 1989), 129; PhotoCrd: Bettmann Archives. ; Bathroom, Biltmore  Anonymous, Interior Design; Schultze & Weaver, Architecture; Los Angeles, CA in Catherine Donzel, et al, Grand American Hotels, 178; PhotoCrd: The Biltmore Hotel. ; Lounge/Ballroom, General Oglethorpe Hotel  Anonymous, Interior Design; Schultze & Weaver, Architects; Los Angeles, CA in Marianne Lamonaca and Jonathan Mogul, eds., Grand Hotels of the Jazz Age: The Architecture of Schultz & Weaver (Princeton, NJ: Princeton Architecture Press, 2005), 195; PhotoCrd: V. & J. Duncan Maps & Prints / 1930 Corridor, Hampshire House  Dorothy Draper, Interior Design; Anonymous, Architecture; New York City in Carlton Varney, In The Pink: Dorothy Draper: America's Most Fabulous Decorator (New York City: Pointed Leaf Press, 2006), 46; PhotoCrd: Dorothy Draper Inc. Archives. ; Salon, Quitandinha  Dorothy Draper, Interior Design; Anonymous, Architecture; Rio de Janeiro, Brazil in Varney, In The Pink, 144; PhotoCrd: Dorothy Draper Inc. Archives / 1950 Lobby, Hotel Elysée  David Barrett, Interior Design; Anonymous, Architecture; New York City in Anonymous, "Hotels Motels," Interior Design 30, no.4 (Apr. 1959): 129; PhotoCrd: Anonymous / 1960 Lobby, Waldorf Tower Apartments  Joseph Huston, Interior Design; Anonymous, Architecture; New York City in Anonymous, "Hotels Motels," Interior Design 33, no.4 (Apr. 1962): 140; PhotoCrd: Anonymous / 1970 Bar/ Lounge, Hotel at Maidenhead [c1970] Anonymous, Interior Design; Derek Lovejoy & Associates, Architects; Maidenhead, England in Architects' Journal, ed., Principles of Hotel Design (London, England: Architectural Press, 1970), 60; PhotoCrd: Anonymous / 1980 Corridor, Waldorf Astoria [c1988] Kenneth Hurd Associates, Interior Design; Schultze & Weaver, Architecture; New York City in Anne M. Schmid & Mary Scoviak-Lerner, International Hotel and Resort Design (New York City: PBC International, 1988), 183; PhotoCrd: Nathaniel Lieberman, IDI. ; Corridor, Morgans  Andrée Putman, Interior Design; Anonymous, Architecture; New York City in Albrecht Bangert and Otto Riewoldt, New Hotel Design (London, England: Lawrence King Publishing, 1993), 14; PhotoCrd: Deidi von Schaewen. ; Bathroom, Morgans  Andrée Putman, Interior Design; Anonymous, Architecture; New York City in Bangert and Riewoldt, New Hotel Design, 16; PhotoCrd: Deidi von Schaewen / 1990 Lobby, Paramount Hotel  Philippe Stark, Interior Design; Anonymous, Architecture; New York City in Carol Berens, Hotel Bars and Lobbies (New York City: McGraw-Hill, 1997), 112; PhotoCrd: Tom Vack/Nancy Assuncao Associates. ; Guestroom, Paramount Hotel  Philippe Stark, Interior Design; Anonymous, Architecture; New York City in Brigitte Fitoussi, Hôtels (Paris, France: Editions de Moniteur, 1992), 65; PhotoCrd: Tom Vack. ; Salon, Los Seises  Jorge Pena Martin, Interior Design; Jorge Pena Martin, Architecture; Seville, Spain in Bangert and Riewoldt, New Hotel Design, 95; PhotoCrd: Harald Raebiger / 2000 Guestroom, The Marcel  Goodman Charlton, Interior Design; Anonymous, Architecture; New York City in Edie Cohen, "Meet Marcel," Interior Design 71, no.11 (Sep. 2000): 80; PhotoCrd: Michael Kleinberg. ; Lobby, Night  Mark Zeff, Interior Design; Anonymous, Architecture; New York City in Bob Morris, "When Darkness Falls," Interior Design 77, no.4 (Apr. 2006): 80; PhotoCrd: Eric Laignel.